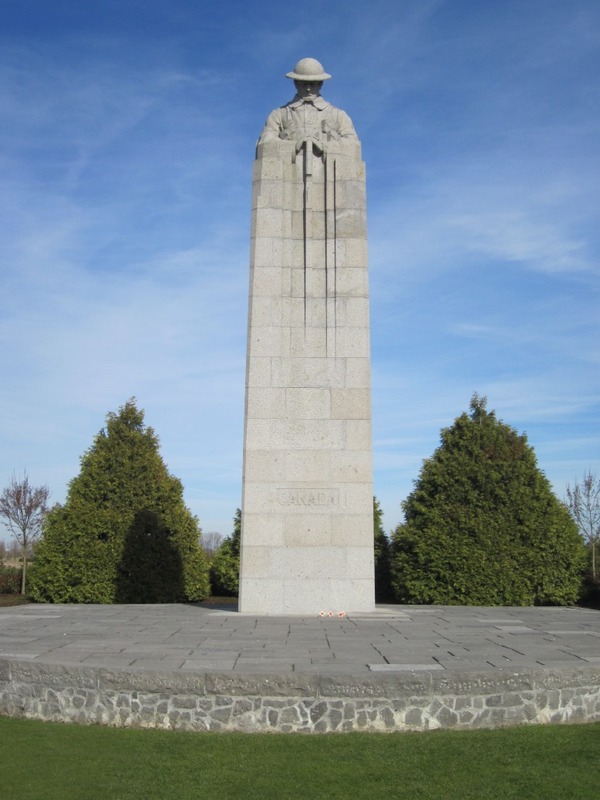 When the Western Front sank into being, it formed a great salient around the city of Ypres that ran up against the Yser Canal just north of Boezinge in Flanders. French and Algerian troops manned the trenches around Boezinge until May of 1915, when they were relieved by British troops. 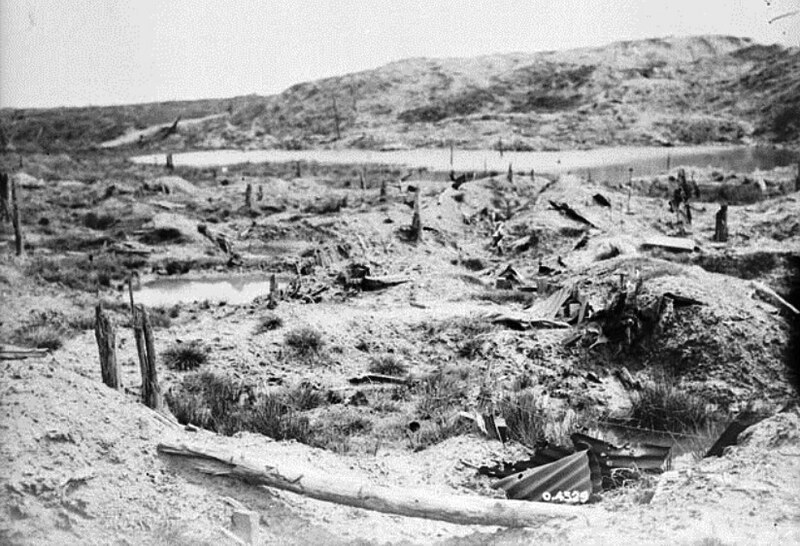 The above photo, which is taken from the vantage point of a place known as the International Trench, shows a spoil-pit that has become a vital observation post; you can see a small lake shining before it. The area is known to the Germans as the Südspitze, or southern tip, for its prominence at the top of the Ypres bulge. The area was hit hard during the opening poison gas attack of the Second Battle of Ypres last April, when the 1st Canadian Division fought the Germans to a standstill near here. Taking heavy casualties from the intense preparatory bombardment and the abysmal state of their shelter, the Canadians withdrew to the secondary trenches to huddle for cover. When the Germans reached the first line and found no resistance, they continued their advance right into a double-set of Canadians armed with new Lee Enfield rifles, who then put up a withering fire. The Canadians stopped the German attack cold and then charged their abandoned saps, reclaiming the lost ground. After another unsuccessful struggle against British troops in June, the Germans dug circumvaling lines of their own and stopped attacking the International Trench. The scene has gotten its name as dark humor. The characteristic churn of ever-putrescing trench warfare, attack and counterattack, have produced a diversity of blooming corpses in the wet, fetid mud. No matter the weather, puddles and ponds adorn the land and the lines. Drainage is a dream, while the festering rot and unspeakable pungency of the situation are made worse by the impossibility of sanitation. Entry: 4:30 am – Field guns, heavies & hows [edit: howitzers] all opened up. MGs opening indirect fire on approaches appalling now. Germans contributed a splendid display of rockets & flares. The strafe lasted violently for 30 minutes, then gradually died down. It was a demonstration to cover attack on International Trench in YPRES salient. Attack was successful. Little reply to our bombardment. Draft of 26 O.R. reported. Bathing & working parties. Gas Alert. Weather – snow. Teasing the message apart: an artillery bombardment pummeled the International Trench first, and for a half-hour, German machine guns opened up from behind the low undulations of the landscape, where they are safe from direct observation, hosing down the areas where the 3rd Battalion would have advanced, had they actually been attacking. ‘Strafe’ is the German word for ‘punish,’ and while it has been used to describe plastering an area with fire for some time before the war, by the end of the conflict it will be more exclusively associated with aircraft firing on ground targets. The gas alert is a product of the weather report that follows it, for both sides have developed a system of meteorology stations to monitor wind speed and pressure, warning units in the line when conditions are right for an enemy gas attack. This morning’s newspapers carry word of the small victory. Mere blurbs based on military public relations information, they are another instance of the limited offensive operations which characterize most fighting in France and Belgium, forming a daily drumbeat of ‘news’ that never changes. Because of the headlines, English language war chronicles record this as the day the International Trench was won, and the error lives on in cyberspace. Today, the 3rd Battalion war diary reads only: “Bathing and working parties. Weather – cold, snow.” The Western Front is never peaceful, but here, at least, it is all quiet.